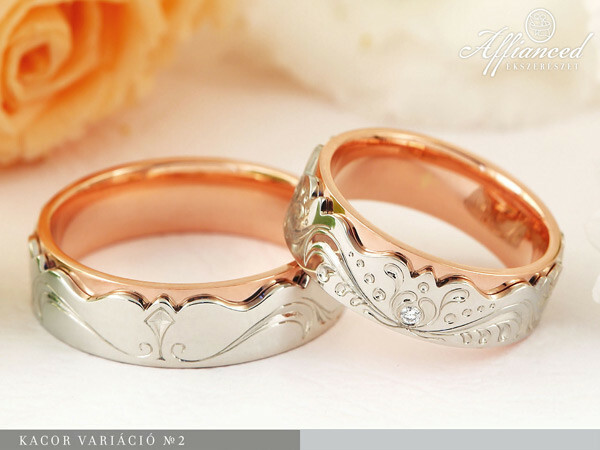 White and rose gold wedding rings with manual engraving and a sparkling, small brilliant. Price category: Affianced Exclusive – click here. BROWSE THROUGH THE WEDDING RINGS OF OUR ‘TULIP’ COLLECTION AS WELL! This collection was born from fragments and ornamental thoughts of our rich folklore, using our own imagination. The most common elements of design in this collection are the heart and the tulip. Long ago, these two symbols were joined together, decorating gifts of affection. The tulip symbolizes the woman, whilst the heart symbolizes the man. We compiled a selection, where you can see our wedding rings on fingers, so you can imagine them, how they would look on your hands. Click here to see the photos of the rings on hands. 10 useful tips for picking wedding rings. Picking wedding rings is a unique experience for couples, because they do not really know each other’s tastes. But here, they could catch a glimpse of the mysterious world of jewellery making. In the last couple of years, we helped many happy couples to find the most suitable wedding rings for their personality and style. To make our costumers’ lives easier we have gathered some questions and answers in connection with wedding rings that might be helpful. With love, Affianced Fine Jewellery. 1. How identical the rings should be? Our experience shows that men prefer less decorated, simple rings, which is absolutely understandable. 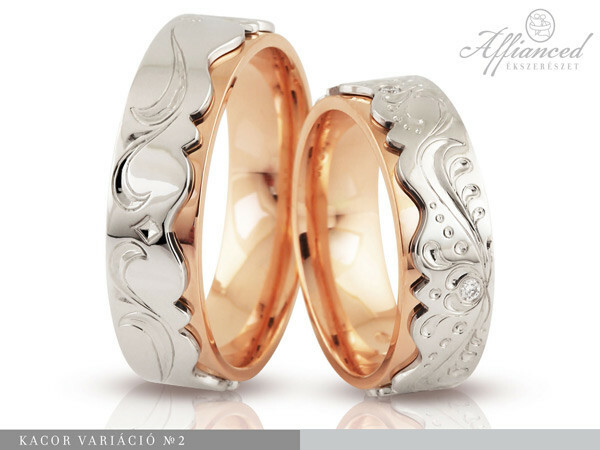 We suggest couples, whatever decision they make that between the two rings there should be some sort of a connection, shape or design wise, so one can see that they belong together. 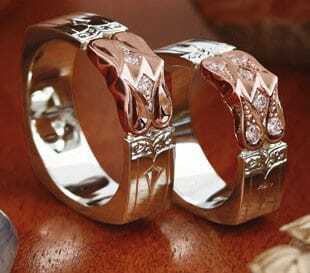 However, the most important detail is that the rings should be comfortable to wear. 2. Which colour of gold alloy should we choose? We work with different coloured gold alloys: white, rosé and yellow gold, naturally we can combine these alloys upon request. There are many factors to consider when deciding on the colour or colours. For example: clothing, personalities, style, and maybe an already beloved piece of jewellery or watch that the bride or the groom wears every day. 3. Should we choose a gemstone in our wedding rings at all? For the ladies we recommend white diamonds, or to be more exact transparent diamonds. We usually decorate ladies’ jewellery with this gemstone. 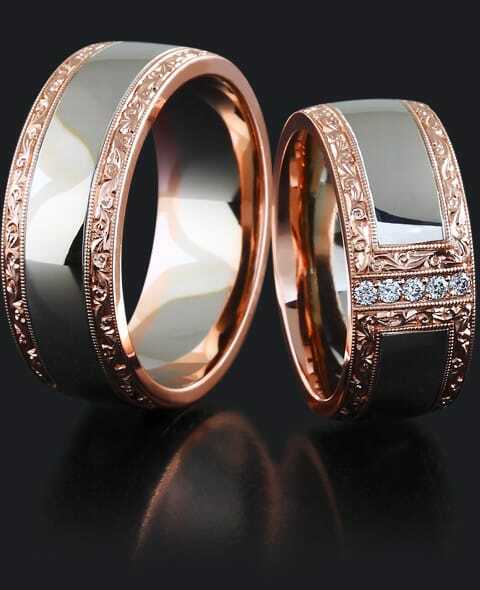 For the gentlemen we suggest brown, cognac diamonds if they do not oppose to gemstones in their rings. We decorate our wedding rings exclusively with different cut diamonds, which can keep their glory for generations because of their hardness. We do not recommend zircon because wedding rings are worn every day and these artificially created stones can lose their sparkle in a couple of years. 4. How wide the rings should be? 5. How could we decide what is the best for us? Couples can find many jewels that are photographed on hands (click here) this can ease the decision a little, but we strongly recommend to come and look around in person and try the rings on. Many times people decide with their hearts, not with their eyes, so this is the reason why a personal meeting is essential, you can fall in love with a ring that you haven’t even considered before. So the best choice is when it comes to jewellery shopping to let your feelings decide. 6. What finish should I choose for my jewels? The surfaces of the wedding rings can be polished, matte, rustically worked or decorated with manual engravings. Gold alloys are soft materials, softer than other objects that we use every day, so scratching is inevitable. The rustic and engraved surfaces can keep their original glory for the longest period of time. We strongly recommend the annual care and renewal. Naturally, our jewellery store provides this service for 5 years, free of charge. 7. Could gold alloys cause allergic reactions? Gold alloys apart from fine gold contain fine silver and fine copper which are not allergic materials that’s why wearing them shouldn’t evoke allergic reactions, except those gold alloys that contain nickel. However, we use the newest European standard alloy, which contains less than 3% of nickel. Those who have serious metal allergy we recommend a white gold alloy with palladium, this cannot cause any kind of allergic reactions. 8. 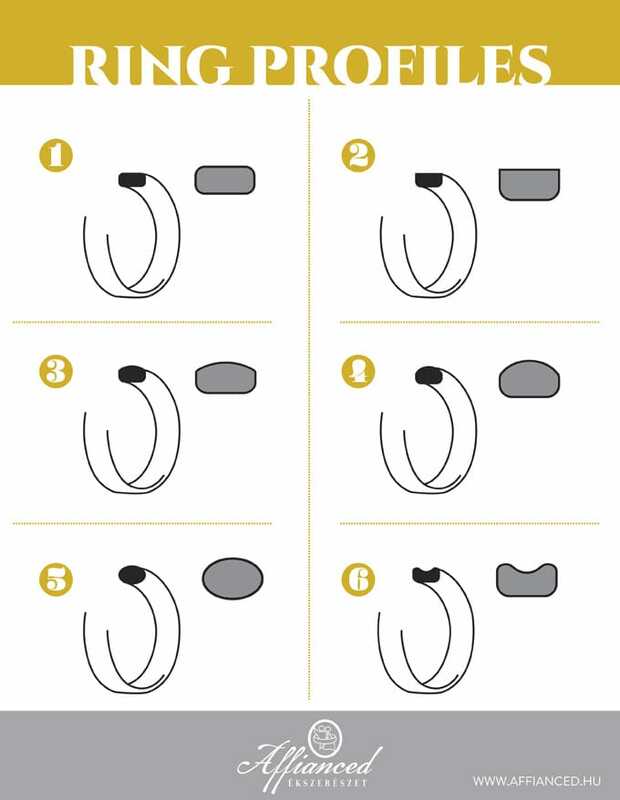 What shape our rings should be? When it comes to form we create round and square rings. The square rings have a very comfortable rounded inside, that’s why they fit nicely together with the fingers. Square shape rings can be as comfortable as the round ones. 1. 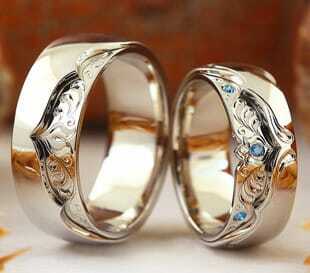 Traditional, round wedding rings 2. Square wedding rings with rounded edges 3. Square wedding rings 4. Wedding rings with three corners. Our jewellers create the rings with a slightly convex inside which makes them rather comfortable. They are not sharp on the edges; they perfectly fit the wearer’s hand. 10. Can we get used to wearing wedding rings? This is usually an issue among the grooms, because they do not wear jewellery beforehand. If somebody is worried about how comfortable the rings will be, that they might bother them while working then let us assure you that anybody can get used to wearing them in a couple of weeks. You are not going to feel them on your finger. We hope that we have been helpful in deciding and we wish you fun times, searching for the perfect pair of wedding rings as future husband and wife. 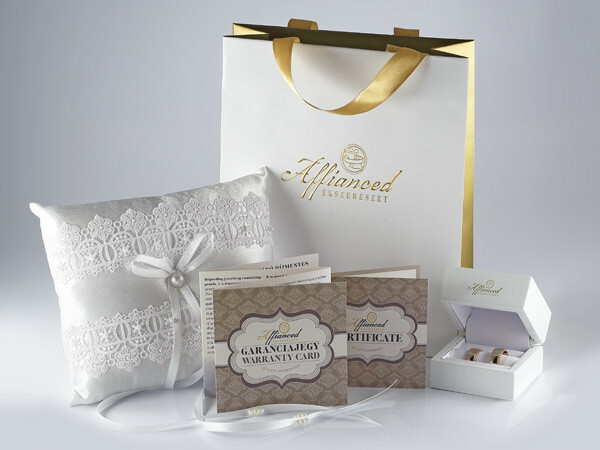 When designing wedding jewellery, we take exceptional detail in creating products that define harmony and the bond between the couple, using different shapes and ornamental designs. 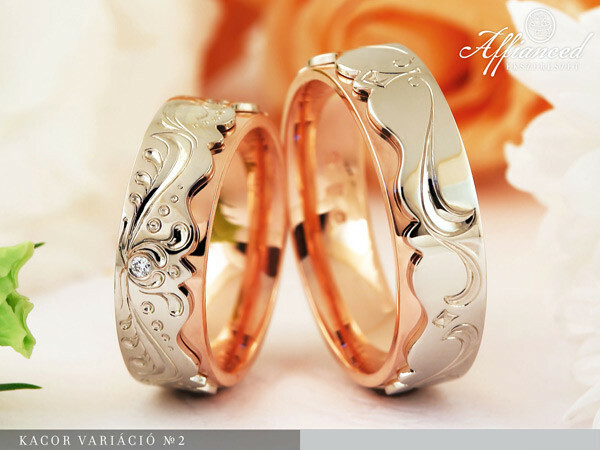 Plus, we strive to make wedding rings which will show the personality of the groom and the bride as well. The first step of making wedding rings is determining the habits of the young couple. Usually we do this at sight, seeing how our customers act, or what their style is. This’ll help us decide if we have to use the classic or more extravagant shapes. During consultation, we give the utmost of our attention to the needs of the grooms, since to them, finding the perfect jewellery is harder. Probably because to most of them, the wedding ring will be the first piece of jewellery they buy, and without any experience they won’t have any ideas, whilst the ladies can choose almost instantly, what would look good on them. Different rings look good on different shaped hands. On long, graceful fingers, wider models are the best choice, while on shorter fingers the thin, nicely shaped ones look good. 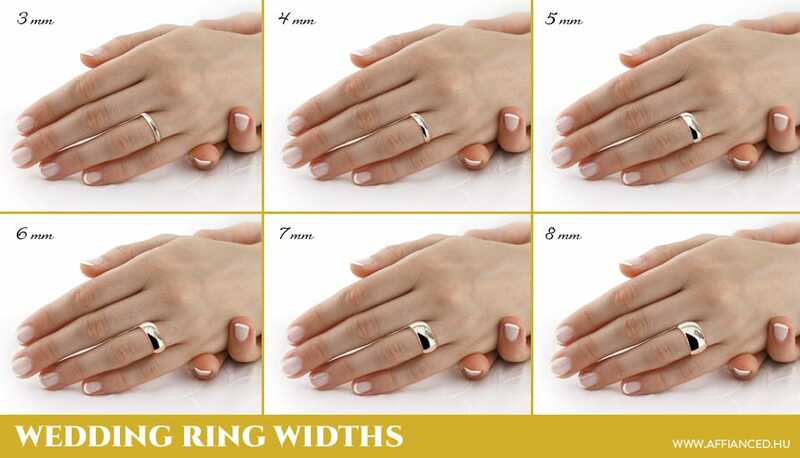 To those with more chubby fingers we advice trying out a ring that is domed on the inside to see how comfortable it is. The same design won’t be as good with those who have thinner, bony fingers with large articulation as such rings will be too big and come loose around the base of the finger. It’s a good idea to try different shaped and sized rings, as the item we fell in love with on a photo might not be the one that fits best. One of the curiosities of our wedding rings is that they are made with combinations of different coloured gold alloys. It is well known that pure gold – which has a strong yellow colour – is not the best choice for jewel. The endurance of it is rather low, and it’s really soft. This is the main reason we make alloys out of it. Combining with different metals, we can give it more fitting physical properties, and also, a whole new range of colours. In the case of jewel pieces, we can give a rather lovely composition by choosing the right alloy as base material. Choosing the colour can be vital in the means of fashion. To some, yellow tinted alloys is the better choice, while there are others whose skin makes red tinted metals look best. This is completely personalized, and strangely the fact that some jewels look best with one particular colour scheme is too. For the decoration of our wedding rings, we use only small diamonds, mainly brilliant and princess (rectangular shaped) rough samples. For the more daring of men, we gladly recommend using precious stones, since they are not only the privilege of women. Amongst our male customers, the so called cognac coloured diamond is a popular choice, which has a really masculine appearance when refined into a square shape. To women, the smaller, snow white coloured sparkling multitude is the one that appeals in general, making a wide selection of variants available. Based on the information above, it is clear that the frequently asked questions about making jewellery are quite versatile. For the truly and completely successful execution, utmost cooperation is required between the customer and the jeweller. In our jewellery, we help our Guests find the best solutions with the experience of decades, making the joy they receive to last for long years, bride and groom alike!